Samsung appears to have a tablet in the works that is large enough to serve as a dinner plate and a coaster at the same time. At 18.4-inches, the Galaxy View is so big that leaked photos show an attachable handle for you to hold like a suitcase. One thing we didn't find out from SamMobile's aforementioned leak or the teaser a month prior was how much this unannounced portable billboard would cost. 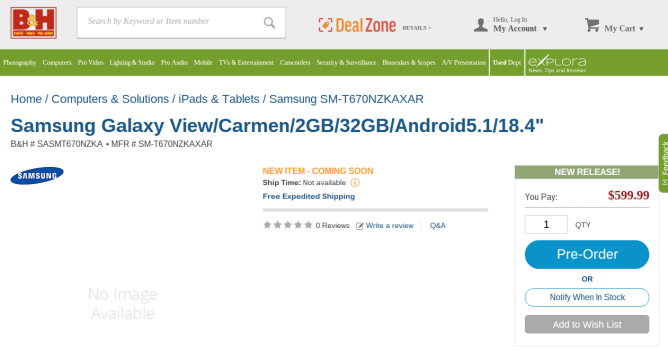 Well, we've now seen pre-orders appear on the websites of Adorama (pictured above) and B&H. The latter has already pulled it down, but we were able to get a shot of the cached page. 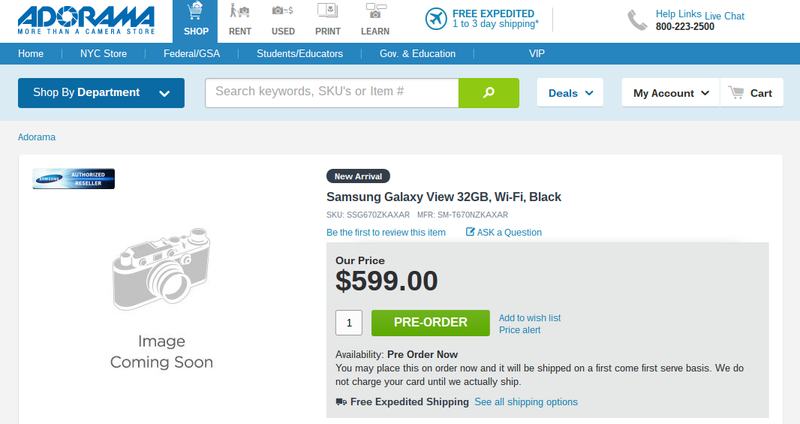 Neither website shows an image or gives any idea when the device will ship, but both have the Galaxy View priced at $599. That's no small amount of money for a tablet. Google's own upcoming hardware is set to go on sale this fall for $100 less. But no one else is exactly trying to convince consumers that they need this much tablet without just calling it an all-in-one Android desktop.